Let’s make this Sunday night more exciting! 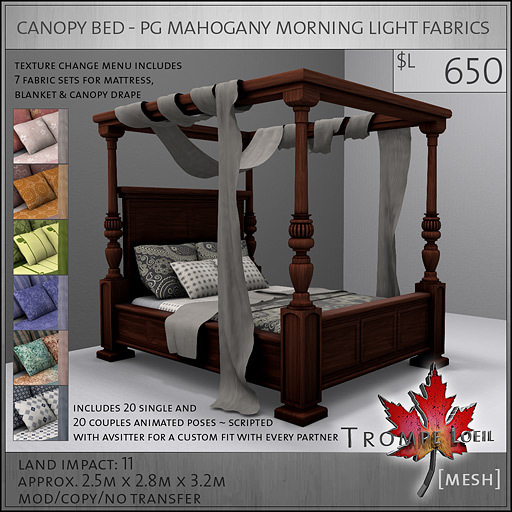 Our popular Canopy Bed has just been updated with an owner-only, menu driven texture change system, and to celebrate we added 2 new Morning Light fabric sets and 4 new Satin colors, we’re updating older single-texture version purchases for free, AND we’re running a special 6 hour blitz sale from 1PM SLT to 7PM SLT Sunday, January 20 only – save 25% off the regular list price for inworld purchases of our new Canopy Bed update! 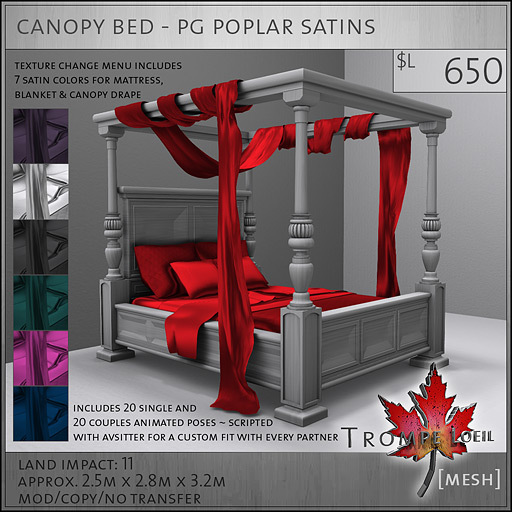 If you’ve purchased a single-fabric version of our Canopy Bed in the past, you’ll be getting a updated version of the frame color you originally purchased that includes the new texture change options, free of charge! 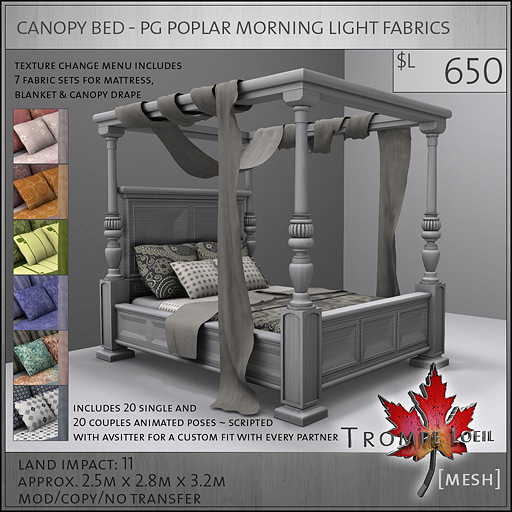 Its our way of saying “thank you” for being a long-time Trompe Loeil customer. Updates will be sent out over the evening of January 20th. 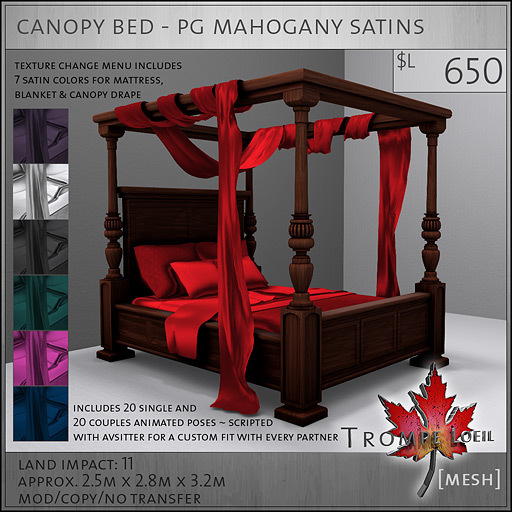 If you accidentally decline the update offer, please contact Cory Edo with your name and purchase information and I’ll assist you directly. 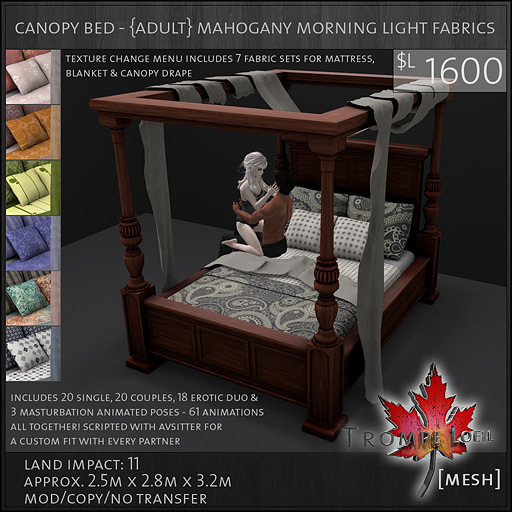 Here’s your ride direct to the Canopy Bed display at Trompe Loeil’s Mainstore!